King Size 104" x 90"- 3pc Set includes 2 Pillow Shams 36" x 20"
HC Collection Brand- Luxurious Comfort, High Quality Products 100% Satisfaction or your MONEY BACK! No Questions asked! Free lifetime warranty included with purchase. 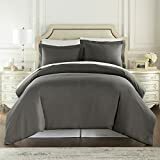 Bed linens and more is the only authorized seller for products being sold on this detail page, purchasing these items from another seller may result in you receiving a fake counterfeit product and will not be covered under our warranty.